Route 13 to Pulaski Technical College is one of METRO’s most popular routes. Pulaski Technical College and Rock Region METRO have partnered to offer PTC students, faculty and staff a fare-free universal transit pass for 2016. On Tuesday, the Rock Region METRO Board of Directors approved the launch of this pilot program, which provides passholders with unlimited bus and streetcar rides for one year. The universal pass program will debut at PTC Jan. 19. The college will supply students, faculty and staff members with related special identification. Passholders will then be able to show their specially marked IDs to Rock Region METRO bus drivers and streetcar operators to use the system, free of charge, during all system operating hours and on all routes. 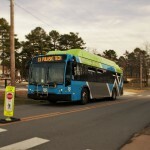 The program replaces a Rock Region METRO corporate pass program in which PTC participated and sold discounted 31-day bus passes to students and employees. Through the universal pass program, PTC will pay one monthly flat fee to Rock Region METRO in exchange for the ability for all students, faculty and staff to have unlimited use of the system. Pulaski Technical College is a comprehensive two-year college that serves the educational needs of central Arkansas through occupational/technical degree and certificate programs, a university-transfer curriculum and specialized programs for business and industry. The college’s mission is to provide access to high quality education that promotes student learning, to enable individuals to develop to their fullest potential and to support the economic development of the state.